A Little Stingray Info Can Make A Visit To The Florida Beaches More Safe And Enjoyable. Knowing some stingray facts and ways to avoid injury can make your Florida beach vacation a lot more enjoyable. Trust me, getting "barbed" by one of these stealth sea creatures can sour you a bit for a return trip to the Florida beaches. Visitors to the Florida Gulf Coast beaches receive stingray injuries every summer. A little stingray info can help reduce those occurrences. Although they are shy, easily frightened animals who will swim away from your presence instead of attack like a shark, they can cause a very painful wound. They like to rest on the bottom of shallow water about 5-10 yards off the beach, which is exactly where people are least alert. People normally either sprint excitedly into the water or are looking out at the beautiful horizon when a sting occurs. They act lazy and spend most of their time in a relaxed state, partially buried in the soft sand expending little energy...just moving with the flow of the surf in shallow water. They camouflage themselves with their coloration that reflects the brownish shade of the ocean floor. Like a chameleon, they can change their color slightly as they burrow into the shallow sand. This is why they are easily stepped on, resulting in an extremely painful sting. Knowing some basic stingray facts will go a long way in helping you avoid this situation. Rays are normally docile sea creatures who want only to hide from being eaten by sharks or larger rays. They have flattened bodies with pectoral fins joined to their heads and trunks. They have a long skinny tail behind. They can live from 15-25 years and some species grow to 7 feet long. Other adult rays may be only the size of a man's hand. The stingray has a sharp, venomous barb on top of its body where the tail joins the trunk. The barb is bony with serrated edges and very sharp tip. The venom is toxic and can actually be deadly to humans. Note: If you happen to find a dead ray washed up on a Florida beach, keep in mind that the barb can remain toxic. Do not mess with it. This is not the time for an impromptu science lesson for the children on your Florida beach vacation. Even though they are carnivores, these sea creatures cannot see their prey. Like their cousin, the shark, they use electro-receptors called ampullae of Lorenzini to detect their prey. They have jaw teeth that allow them to eat shrimps, worms, crabs and oysters. They do not attack. The toxic barb is used in self-defense and the tail is whipped over their body much like the action of a desert scorpion. 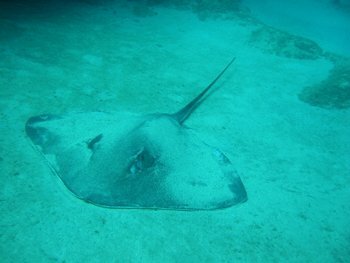 Humans get stung when they step on a ray and pin it to the sandy bottom, or try to catch it by its tail. (As idiotic as it sounds, people actually try this.) Their sting is a reflex self-defense maneuver. An important stingray fact is knowing the best defense against getting stung. Be vigilant about doing the Stingray Shuffle when you first enter the water. 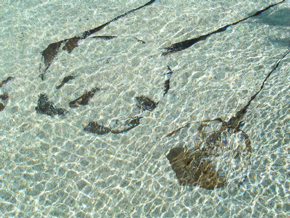 The vibrations frighten the rays and they quickly swim away. This is what locals have been doing for years, myself included. Do not carelessly slosh around or jump around in the first few yards from shore. This is where most people get stung. 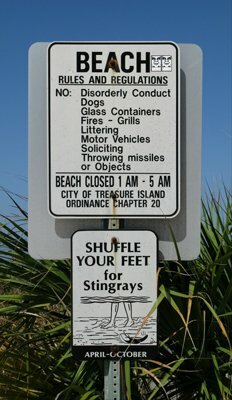 Here's an important caveat to the stingray facts you are filing away: Shuffling will not guarantee that you will not get stung, (neither will wearing sneakers into the water) but shuffling will go a long ways for preventing an wound. If you or someone else is nailed by a stingray, get out of the water and onto the beach. If you are at a Florida beach with a lifeguard, notify them. Find the wound and determine the severity. Many are minor, but if the would is spurting blood it means an artery was compromised and this is an emergency situation. Apply pressure with a towel or shirt to control the bleeding and use a cellphone to call 9-1-1. 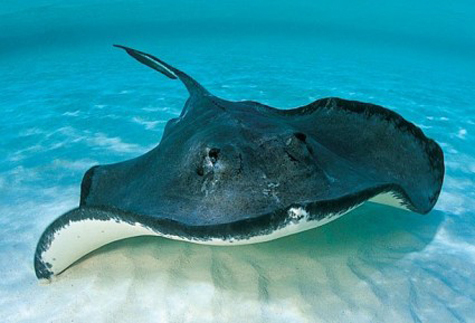 Like bee stings, all individuals react differently to the venom from a stingray barb. The toxic element can cause a dramatic drop in blood pressure, an increase in heart rate, disorientation, dizziness and shock. If the person looks like they are losing consciousness, call 9-1-1 and treat them for shock until the paramedics arrive. If you van see the barb broken off at the wound site, this means they must see a physician immediately. Do NOT attempt to remove the barb!. Attempting to remove it will only inject more poison into their system. This is a job for a physician. The majority of wounds are quick, fleeting strikes that are excruciatingly painful for several hours, but are easily taken care of with soaking the injured area in soapy hot water. Talking with the victim and assessing their condition will dictate what you need to do. If there is any doubt, take them to a doctor. I do not want you to think that stingrays are lurking like an army along the shoreline of Florida beaches. You do not need to live in fear that your next step will be on top of one. They live in the ocean and once in awhile they interact painfully with humans. This is NOT an everyday occurrence on Florida beaches. Visitors and locals can swim for weeks without an incident. Just be aware when you enter the water, especially in the early morning or as the sun is going down in the evening...and shuffle your feet when walking on the bottom. Hopefully, these stingray facts and tips will make your visit to our beautiful Florida beaches more enjoyable. 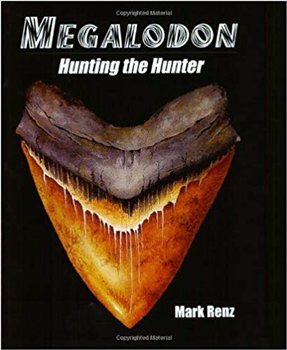 Megalodon. Searching for the apex predator. Hunting The Hunter.